Steve Livigni and Daniel K. Nelson, of ‘Drink, Inc.’, have come up with a brilliant drink built around my favorite agua fresca, horchata. You can check out the story behind the drink by watching their youtube video (spoilers: they invent it for some restaurant). We wanted to do it properly and make our own homemade horchata… Unfortunately neither of us had ever made it before, and every recipe we could find was different. Apparently there are a million ways to make horchata, and everyone seems to have their own recipe. We decided to wing it and make up our own. Combine rice, milk, and water in a medium-sized pot and heat it up over a medium heat. Crumble up the cinnamon sticks into the pot. Split the vanilla bean down its center and add it to the pot too. Don’t let it boil, just keep it warm, and let it cook for about 10 minutes, stirring constantly. Stop before the rice is fully cooked. Dump the lot into a blender, add additional water, and purée. Keep going, adding water until the desired consistency is achieved. Strain through a cheesecloth. In the end, we sweetened things up with some vanilla/cinnamon syrup, to taste. If I were to make horchata again, I might add some raw, chopped almonds while the rice is cooking, and perhaps omit the milk altogether (subbing in an additional cup of water instead). There is certainly room for improvement and experimentation here, so if you have any horchata advice, please share your tips! Dry shake (to froth the horchata) and serve over crushed ice. Garnish with a lime wedge, star anise, cloves, and grate fresh cinnamon over the top. The original recipe calls for spice-infused mezcal, but they never mention what sort of spice to use. We just used regular mezcal. No regrets. Mezcal and horchata work astonishingly well together. The spices in the garnish highlight the cinnamon pep provided by the horchata, and the mezcal’s flavors are truly transformed, shifted toward the sweeter side of the spectrum, but still complex, bold, and smoky. This drink would pair perfectly with some delicious adobada tacos, and has become one of my all-time favorite mezcal drinks. ¡Disfruten sus bebidas, mis compañeros de borracheras! Salud. Categories: modern drinks | Tags: alcohol, bartending, blended, blender, booze, cinnamon sticks, cocktail, cocktails, drinking, drinks, horchata, mexican food, mexico, mixed drinks, modern cocktails, modern drinks, oaxaca, star anise | Permalink. 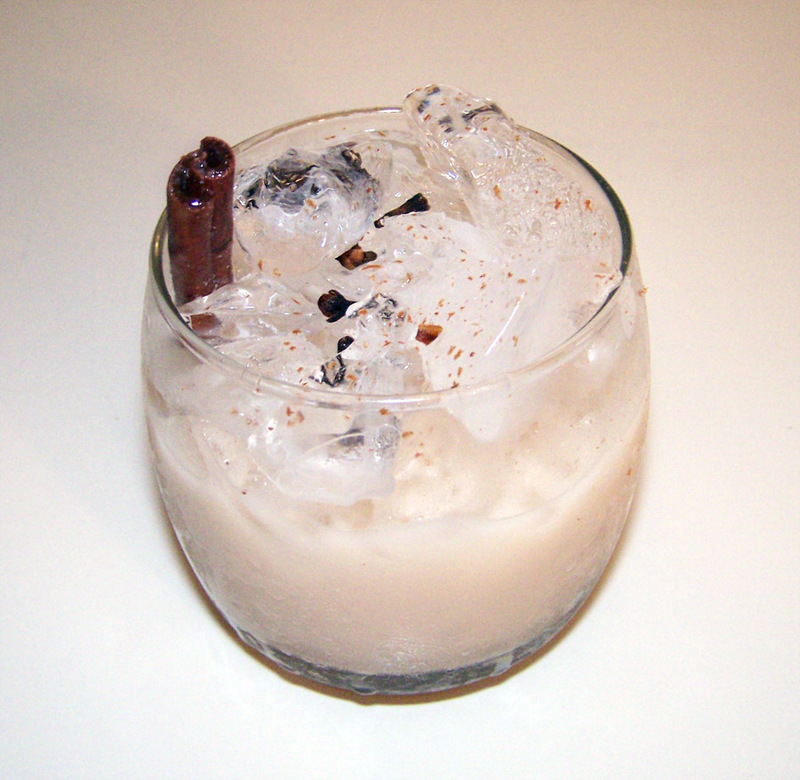 I use an Almond Milk based Horchata (Califia) with Tres Papalote Joven Mezcal, Agave Syrup, Cinamon stick for Garnish.